i had a full day. i have to squint in order to remember all the things i did today. to say the least, i'm tired like i should be sleeping already, if i close my eyes for more than a second i'm going to be unconscious, for real. my day started at 8am this morning. 7:55am actually, which was how far i was able to incremently snooze my cellphone alarm clock before i got out of bed, get dressed, and went across the street to paint. i had to do the walls of one bedroom, edging first, then rolling the rest of it. i spent 3 meticulous hours painting the edge. by the end of the 3rd hour, i could feel myself getting sloppy, the painting was getting to me. i was so relieved when it finally came time for me to roll. i rolled one wall, it looked fabulous. i was so happy, i was so relieved to be minutes away from finishing the painting. then, within the span of a couple of seconds, my happiness suddenly disappeared. i couldn't find the can of paint i've been using, and jeff had just started doing the trims, and i looked to see what can of paint he was using, and it looked very familiar, and then i realized what had just happened: i painted with the wrong paint. i used the semi-gloss reserved for the trims instead of the decorator white jeff told me to use. in my defense, there was a lot of white paint everywhere: white primer, white ceiling paint, white wall paint, white oil-based wood primer, white semi-gloss. it went on fine, and even jeff couldn't tell, remarking how good the new paint job was looking. i clenched my teeth, cleaned out the tray and roller, and then left, almost in shock that the almost 4 hours of backbreaking painting i'd just been doing was completely worthless. i bumped into bruce (my painting partner), who was wandering the neighbor, and i told him what i'd just done. i came back to find jeff, but he was gone, so i left him a note apologizing for the mistake and informing him i'd be back tomorrow to finish the job. i took a shower and had a microwaved chicken pot pie for lunch, while simultaneously doing my laundry, answering a phone call from a client, and aiming carrie a happy birthday. the weather was very nice on this so far very bad day, and in my mind i knew what i had to do. i got dressed and walked down to the cafe (about a mile away), where i drove the car back to belmont, where i would embark on my first motorcycle ride of the new season. before i could do that though, my father and i went to home depot to get some gardening supplies. i wanted to get some clay pots (a medium sized pot with my design was selling for 77 cents), but ended up getting a 36" terra cotta colored plastic trough, more space efficient as i don't have too much space for pots on my backyard deck. we came back home, where i dumped all my gear and hopped on the motorcycle. the experience was, for lack of a better word, like just riding a bike. i took my usual long way home, down memorial, across the longfellow, and then back around via storrow drive. the weather had started to cloud up a bit, and on the back of a motorcycle, subtle shifts in temperature become quite noticeable. i was a little bit cold, but that was tempered by the exhilaration of being back on a motorcycle again. coming back on storrow drive rounding a curve, i almost wiped out though. i took the turn too fast, the bike slanted a little awkwardly, and i instinctly stuck my leg out to brace myself, which, traveling at a speed of upwards of 55 mph, meant certain catastrophe. luckily i was able to right myself in time and my foot never did touch the ground. that sort of took the air out of my recklessness and i returned home riding as safely as possible. back in belmont i gathered up my photo gear and took the motorcycle to habitat up in belmont hill. not wanting to repeat a history lesson i've learned before, i flipped on my gps prior to venturing into yet another forest. the place was pretty buggy, and there were a few times when it seemed like something flew into my eye. i was curious about the vernal pool highlighted on the map, and made a beeline towards it. 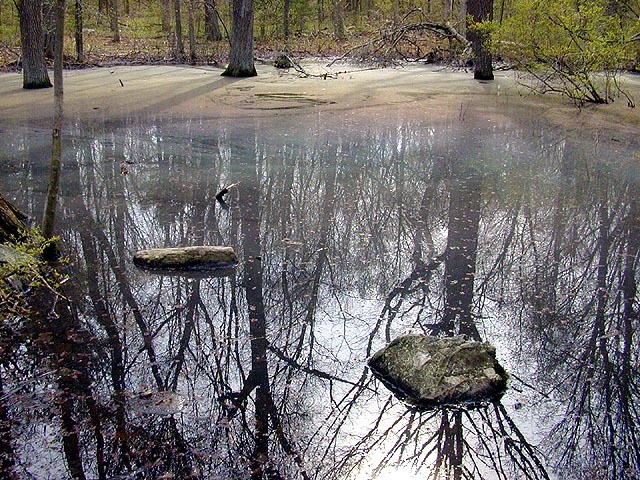 i didn't see or hear any wildlife at the vernal pool. 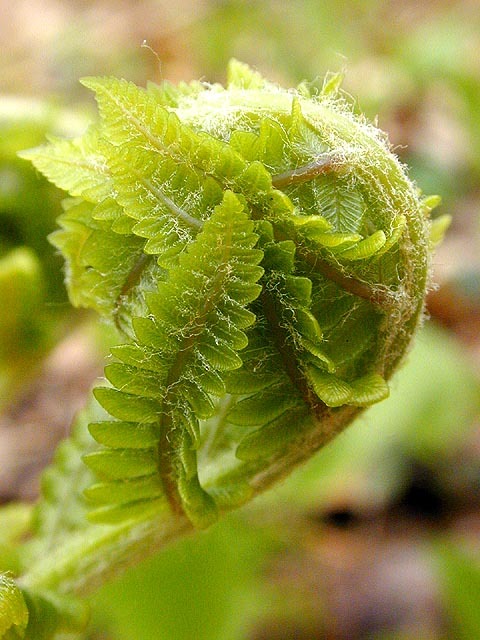 along the shore, fern coils were starting to unfurl. the pool definitely had a mysterious aura about it though, the water was smokey and motionless, with the tree filtered sunlight hitting the surface. i took a call from renata asking i was still interested in going on a walk with her. a group of tour guided children wearing rubber boots gathered at the pool just as i was retreating. i wandered about habitat a bit more, disappointed that i didn't see anything new (except the vernal pool, even though it was lacking in visible activities, and also a yellow violet), before finally leaving. i got to renata's close to 5pm. i was happy just to do the fresh pond loop again, but renata was up for adventure, so we decided to hit the mt.auburn cemetery via car. i accidently left my keys on the motorcycle seat, and was lucky to see them when we left the house. 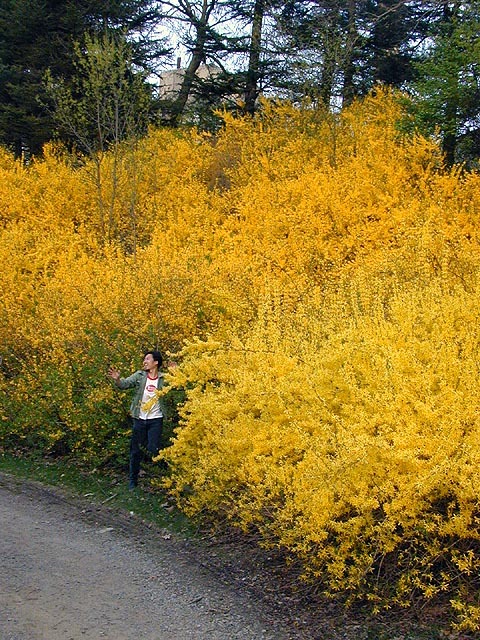 at the last minute, we changed our plans to the arnold arboretum, only after renata said she knew a secret shortcut to get to jamaica plains (heading towards the faulkner hospital). we stopped by the allandale farmstead/garden shop. renata used their bathroom, i sniffed a bottle of coyote urine, and we saw a cow grazing by a small pond. 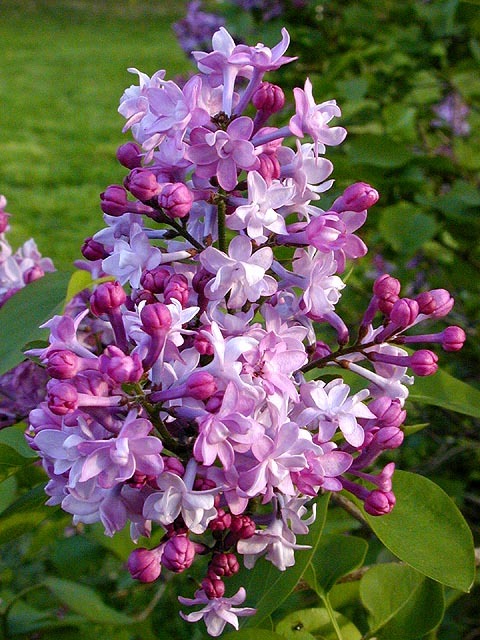 this sunday is "lilac sunday" at the arboretum, an annual celebration of lilacs (which only bloom for a short three weeks) that happens to coincide with mother's day. renata and i made our way to collection 12, home of the lilac bushes. we knew we were near because we could smell the lilac fragrance. we then went from plant to plant, seemingly pollinating the flowers with our noses. in the car ride to the arboretum, renata revealed that lilacs are her most favorite flowers of all times, with lily-of-the-valleys a close second. 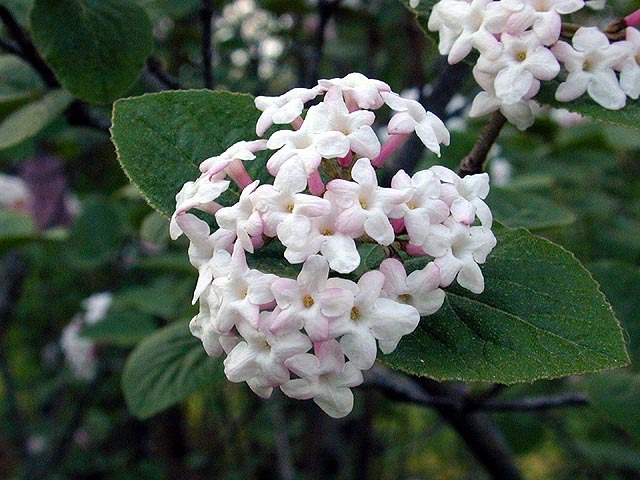 also: a very redolent bitchui viburnum (from korea), which i said was a lilac but renata disagreed (she's right), and ground covering large flowered trilliums, each one like a georgia o'keeffe painting come to life. after the arboretum, we made a search for food. i had some idea of maybe some kind of vietnamese/thai fusion in the heart of busy allston center, but first we had to get there, and that involved some creative hunch driving, but we finally made it. unfortunately, close to 8pm, finding a legal parking space in allston is next to impossible, so we opted to go to sweet chili in inman square instead, where parking wasn't an issue since renata had a residency sticker on her car, but we found a space a few yards from the restaurant anyway, shear luck. sweet chili was surprisingly empty for some strange reason, but more people did arrive later in the evening, probably coming back from enjoying the nice weather all the day. we got the spicy mango salad, which was an interesting salad but its hot flavor surprised me a bit. the mango curry was excellent though, definitely worth a try next time. the tom yum seafood noodle soup though wasn't what i ordered the last time i came to sweet chili, a little too seafood for my taste, but still tasty. after dinner, renata drove me back to her place, where my motorcycle was still parked outside. i got my helmet from her place then rode home to belmont, where my father stowed the motorcycle and i got a ride back to cambridge. 10 hours later, i was finally able to put my damp laundry in the dryer. celtics down 0-2, and who died on dawson's creek?